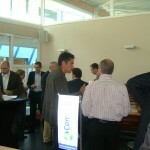 Combell and Emerio recently organized an event for young starting internet entrepreneurs to gather them with investors. Although recent phenomenal amounts are listed for Internet sites like LinkedIn or Facebook, Belgian projects are not very popular among banks and investors for gathering the necessary financial resources. A Belgian Internet fund is proving to be an obvious necessity. On June 9, Combell and Emerio organized the Internet Starters Event in order to bring young starting internet entrepreneurs, looking for funding, in contact with investors. The six internet entrepreneurs were: Blue Talk, Nomatime, Check This, Streetpage, devoetbalmarkt.be and dRobots. "This was the first time that more than 30 investors were present including a number of business angels, private investors and funds. This was a unique opportunity to gather both parties and this by means of a different approach, other than the traditional route through funds and banks," says Nico Daminet, CEO of Emerio. Although gigantic sums are being mentioned in the media for e.g. the recent IPO of American internet companies, in Belgium it’s not that easy to find money. "In our country there’s a reduction in the number of funds focusing on the Internet sector. Moreover, there are no funds that focus on the "early stage" opportunities of several hundred thousand euros. What’s no problem in America, seems to be a different story in Belgium," Daminet said. The first results of this meeting are already being met by actual contact sharing between internet entrepreneurs and financiers. Given the success and positive feedback from all parties, we plan a second event after the summer. We still have room for interesting projects, so those interested should contact us. "The need for a Belgian internet fund is very obvious. There are many creative and potential ideas in our country, and it would be regrettable that most of them couldn’t be realised solely because of a lack of investment," says Jonas Dhaenens, CEO Combell. "12 years ago I also started as a young internet entrepreneur, and I recognize the needs of new starters. Therefore, we are currently starting an internet fund, together with other Internet entrepreneurs and investors. The goal is "smart capital" – capital with internet business experience - to provide for starting and / or growing internet entrepreneurs," said Dhaenens.